Philadelphia Public Relations Association awards Bonnie Squires. The Philadelphia Public Relations Association presented its top honor, the Hall of Fame award, to expert communicator Bonnie Squires on Monday, May 1, 2006, at a luncheon at the Hyatt Regency Philadelphia at Penn's Landing. Journalist and Media Personality Maury Povich Delivered Keynote Address. 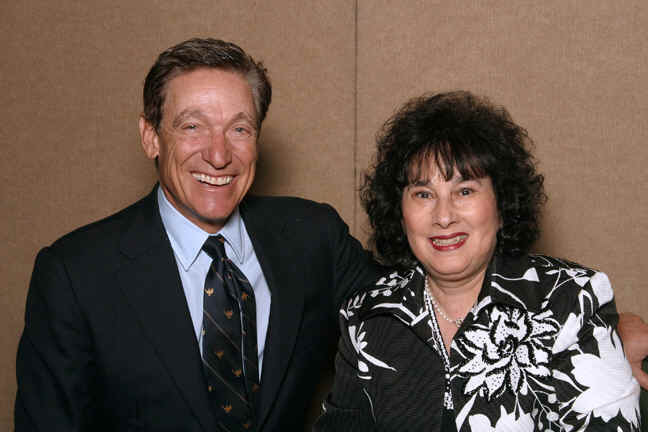 with having gotten him involved in Penn's alumni program, as well as development activities: Povich and wife Connie Chung sponsors scholarships at Penn for minority students. Pat Ciarrocchi, CBS3 news anchor, and a former colleague of Povich's when he was a news anchor in Philadelphia at KYW-TV, introduced Povich. on behalf of Senator Connie Williams. is currently a co-host of a weekly hour-long call-in talk-show, Prism, on WHAT-AM (1340). She is a weekly columnist for the Main Line Times and several Jewish newspapers around the country. Her opinion pieces have appeared in The Philadelphia Inquirer and dozens of local, regional and national newspapers. She also hosts Bonnie¹s Beat, a weekly cable television show in Radnor Township. is newsletter editor of the Class of '62 at the University of Pennsylvania. has a BS in Education and a master's degree in English Literature. She has pursued doctoral studies at Temple University and taught public relations at Arcadia and Drexel Universities. She resides with her husband Sami Ouahada in Wynnewood, PA. The PPRA Hall of Fame award honors a public relations professional who has brought honor, respect, acclaim and recognition to both our industry and our community. Since it¹s inception in 1972, 31 area professionals have been inducted into the Hall Fame. Each year Hall of Fame members review candidates for induction and vote one professional into the Hall of Fame. The annual luncheon welcomes the new member and celebrates the highest ideals of the public relations professional. The Philadelphia Public Relations Association, Inc. (PPRA) is the premiere association for public relations professionals in the Greater Philadelphia region. Founded in 1945, and with more than 350 members from all areas of the communications and public relations industry, PPRA is the nation¹s oldest and largest independent association of its kind.